Clump #23: Contact friend and record birthdays on two calendars. Here’s another item from the hidden to-do list uncovered during the bureau-blasting of the previous post. 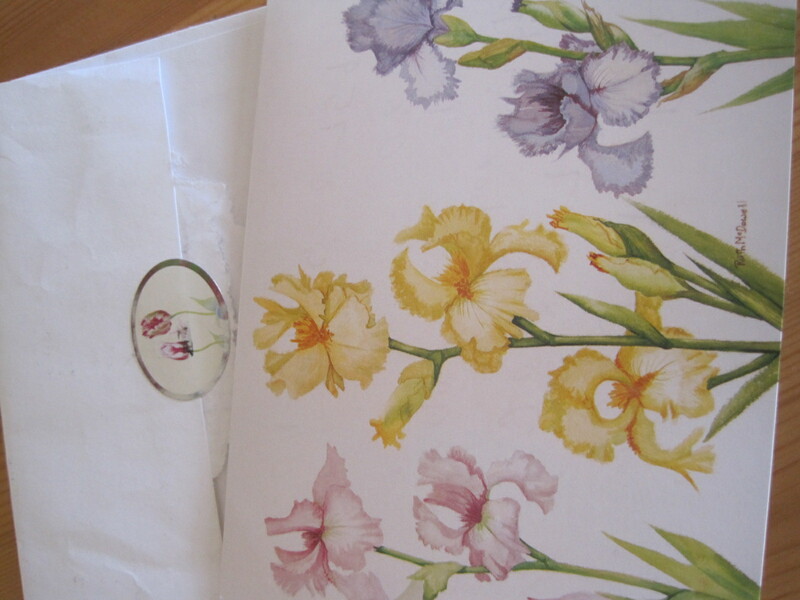 An old, dear friend had sent me the address and phone number of another old friend on this lovely card. I had meant to contact the second friend right away. Putting the card on the bureau would remind me. As always, the longer anything is put off, the more prone to becoming lost it gets, the more guilt is attached, and the worse the detonation when uncovered. Clutter-mines are guilt bombs. What was holding me back? Well, I hadn’t called this friend in many years. Does she want to hear from me? It’s a cold call, and the product I’m selling is myself. I guess fear of rejection is at the bottom of the pit, but this is mostly operating in my subconscious. It withers in the light of day, on the typed page. I finally called her and left a message on her answering machine. I wasn’t sure (from the odd sound) whether it recorded, so I followed up with a hand-written note. I’ve done my part; I can feel joy at the sight of irises again. Next up: I had not entered birthdays in my 2013 calendar, and had missed my brother-in-law’s birthday. More guilt! Another friend gave me a perpetual calendar this year. Very thoughtful. 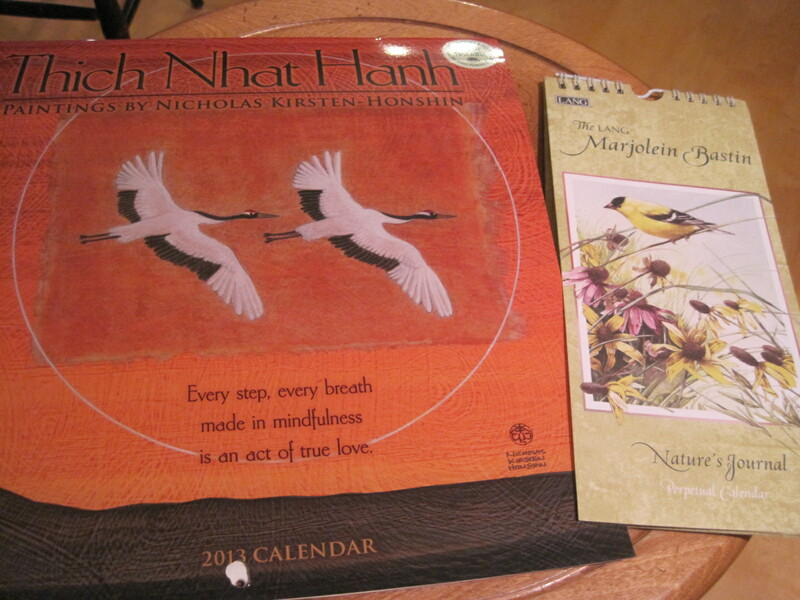 I entered important dates on it and on the kitchen calendar with quotes by Zen Buddhist monk Thich Nhat Hanh. I’ll do better next year! I sent my brother-in-law an article I had been saving since July 9, 2011! He is a Three Stooges fan, and I thought he’d enjoy reading about The Stoogeum, located in Philadelphia,”The world’s first and only museum dedicated entirely to the Three Stooges.” Occasionally treasure is mined from the depths of piles. 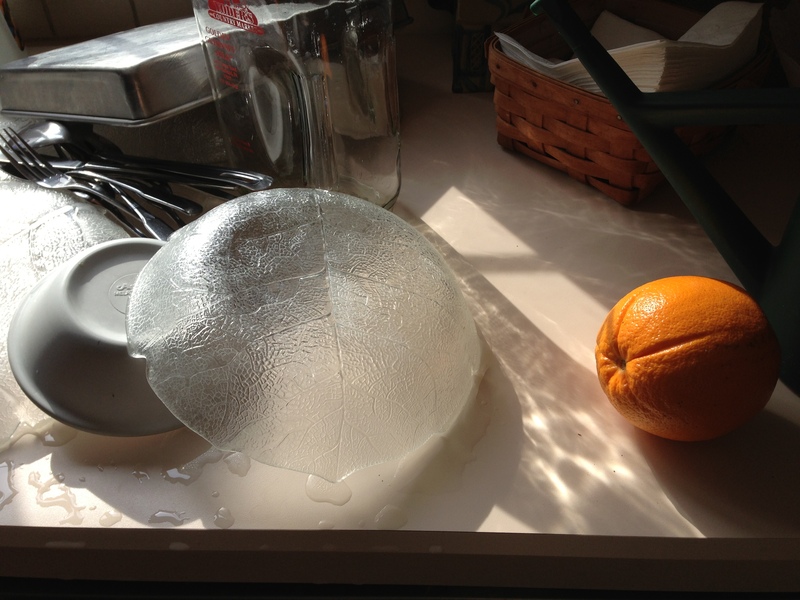 But with the image of an orange in mind, I noticed there was one right next to me at that moment. 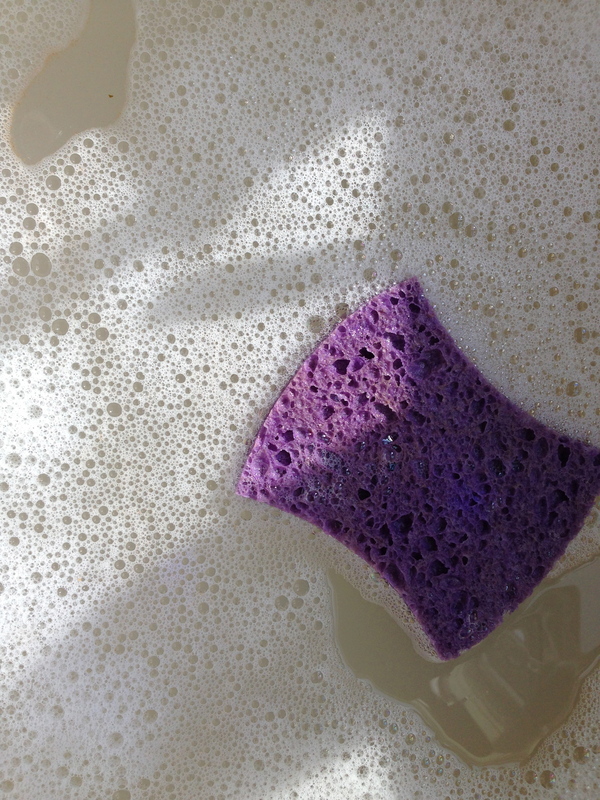 I find when I read your blog entries I move into a state a mindfulness. I truly savor every word…appreciating each visual image you provide or create (verbally)…and filling with love as I experience your lovingkindness flowing through each ‘episode.’ Thank you, dear Judy, so bringing me such joy. Thank you so much!! You inspire me. nice! You have taught me through these posts to look right next to what we think we are looking at for further influences. 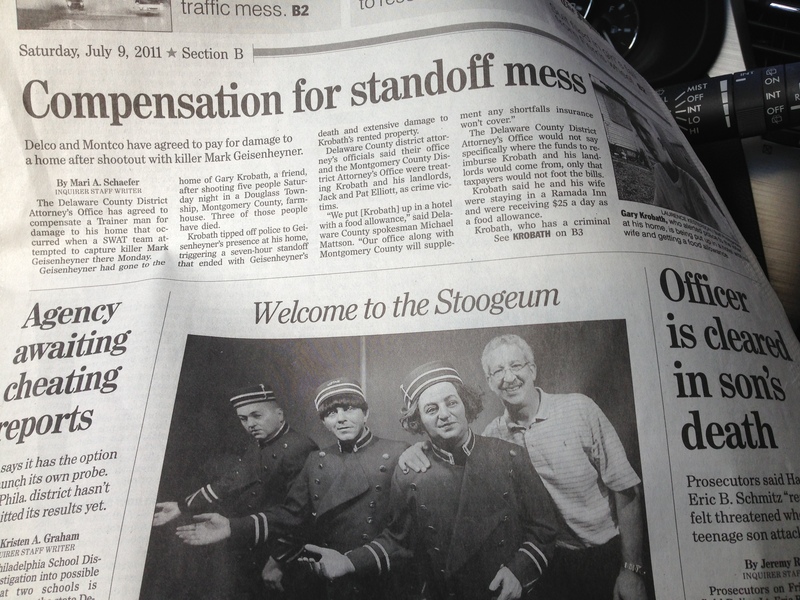 Did you see the headline above the stoogeum article, “Compensation for Standoff Mess”? I know it of course was not referring to you but really, there is compensation for finally uncovering the ‘mess’ that you had previously stood off from. Yeah! Great observation, Jane!! �I hadn’t made the connection. �Great synchronicity! �Thank you so much for your enthusiasm and all your help. info right here in the post, we’d like develop more strategies on this regard, thank you for sharing. . . . . .